This means a magical battle to the death, of course. Calling the previous Beatrice “Madam Beatrice”, Ronove makes sure he and the seven stakes step back, and hostilities commence with a blast that leaves a huge hole in the ground. In the ensuing battle, the witches fight each other with some impressive summons and a lot of noise which should have attracted everyone on the island. The battle ends when the previous Beatrice successfully drives multiples spears into the present Beatrice. Coughing up a lot of blood, the present Beatrice is quite pitiful and asks for forgiveness, but the previous Beatrice tries to make the present Beatrice remember how she was. However, the present Beatrice is hardly willing to concede defeat. In fact, she had successfully attacked the previous Beatrice with spears from the behind, a fact which the previous Beatrice was not even aware of until it was mentioned. Her wounds completely healing, the present Beatrice gloats over the dead body of her former teacher. She just enjoys giving people hope and then destroying them completely: this is why she had revived the previous Beatrice. Meta-Beatrice did the same thing with meta-Battler, making him feel like he could win in episode III-I and then crushing his morale in episode III-II. And after having seen what had just happened, he throws a tantrum that there is no way he could now deny Beatrice’s magic. He probably saw the whole thing with the servants and not just the previous Beatrice, unlike in the previous arc where there is no indication he actually saw anything magical. Meta-Beatrice and meta-Ronove arrive, the former enjoying herself far too much and unable to stop laughing and the latter telling meta-Battler that meta-Beatrice expects a counter from him. The time is now 6:00AM. The parents have just spent all night awake trying to anticipate Beatrice’s actions. When they go out of the room to get some breakfast and go to sleep, however, they are struck by a terrible smell. They also find blood having spilt out the locked door of a nearby room, where the door also has the Seventh Magic Seal of the Sun (explained in episode I-III) drawn in blood. Kirie notes that the same drawing is on the locked door to the boiler room, which is where the terrible smell is coming from. The parents split up, one group checking out the kids and the other checking out the rest of the mansion. The kids are sleeping and are just fine, where Nanjo shows up asking what is going on. They are unable to find Kinzou and any of the servants, however. They also find other rooms with magic seals drawn on the door, which happen to be locked. The keys that should have been in the employee room are missing as well. They do find Shannon sitting in a room when they go out in the rain, but they have to break in through the window to get in, where they find her dead. In the garden, meta-Battler is completely demoralized and sulking when the previous Beatrice shows up. He is surprised at her appearance, having thought her to be dead, but she confirms that she did indeed die. She says that she is a captured piece waiting outside the chess board: this seems to be a significant hint of what the world of Umineko no Naku Koro ni is like. Meta-Battler’s mood does not get any better when she confirms that she is a witch, and she offers to teach him a little piece of magic, which the apathetic meta-Battler is just peachy about. She brings up the Japanese rain summoning ritual (it involves setting fires on a mountain), but Battler points out that there is nothing magical about it since it is well known that the fires causes an updraft which promotes the formation of rain clouds. This is the point the previous Beatrice was trying to make: things that are not magical were considered magical in older times, and the same thing might be happening on Rokkenjima. She brings up another example with a television: until one looks at what’s actually in it, one may as well explain its workings with gremlins. Despite being fallacious examples, they are good analogies for what she wants to say about Rokkenjima: like Schrödinger’s cat, more than one truth can exist until one opens the box. The Copenhagen interpretation of quantum mechanics postulates that quantum states collapse into a single state when they are observed in an ill-defined manner: I wonder if there is going to be someone who serves the role as an independent observer for Rokkenjima? In any case, the previous Beatrice points out that meta-Battler is having problems because he has started to believe in magic. This just has meta-Battler exasperated that no one can win an argument against anyone if multiple truths can exist at once. So she points out that meta-Beatrice has been doing just that to meta-Battler, the implication being that meta-Battler could turn the tables as well. 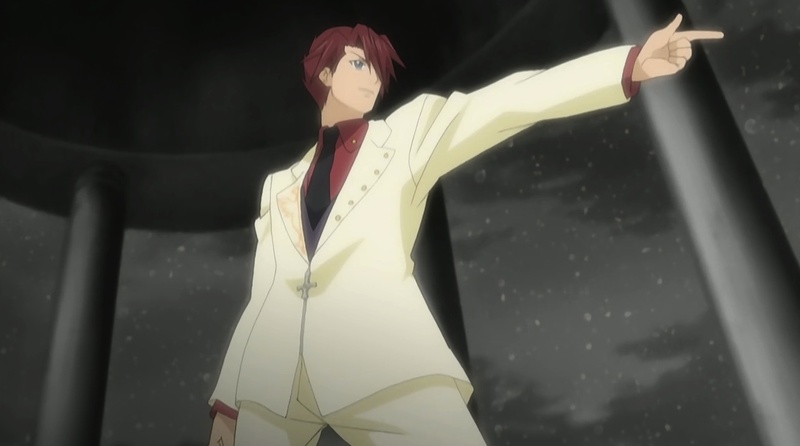 This seems to make Battler feel better, and he asks for her name. She no longer has one, so she tells him to call her Vergilia (ワルギリア, ‘Warugiria’) after first considering the name Vergilius, which are not pronounced in the typical English manner but with what is presumably classical Latin pronunciation. We don’t have to keep calling her “the previous Beatrice” anymore. Meta-Vergilia is willing to help out meta-Battler, who is quite aware the irony of trying to argue against magic claimed by a witch, in a world that cannot be explained by anything but magic, with the help of yet another witch. Meta-Battler must have been quite aware of how odd the situation he found himself in, even if we haven’t heard him say anything about it before. But if it means it could stop what is happening on Rokkenjima, he’ll happily accept her help. And meta-Battler gets a huge morale boost. Meta-Battler shows up where meta-Beatrice is having tea with meta-Ronove in attendance. Meta-Beatrice is ready to enjoy how meta-Battler squirms about the fantastic battle he was shown, but her fun gets deflated a bit when he flat out denies it happening. There is absolutely no trace of the battle in the garden now, which implies that the battle never actually happened. I would have also mentioned how no one seemed to have noticed the noisy magic battle outside. Meta-Beatrice is annoyed at his flippant answer, and Ronove explains that he is using the “multi-layered world contraction skill” (多祖収縮説), which apparently is a very effective tool against limited and endless witches. It also apparently means using the concept of Shrödinger’s cat, although I’m not clear if it’s the both alive and dead part or the becoming alive or dead when the box is opened part: the former is useful for maintaining contradictory beliefs, but I would say meta-Battler forcing the conclusion to a particular one is more useful. Meta-Beatrice guesses that meta-Battler is being helped by meta-Vergilia, who soon shows up in person. Meta-Vergilia, who calls her former student by the affectionate nickname “Beato”, openly declares that she is going to be on meta-Battler’s side. Meta-Battler now has a counterpart to meta-Beatrice’s meta-Ronove as well, and he is ready to make a comeback. The time is 7:00AM. The parents are now arming themselves, and we see that there are at least four guns. Presumably without Kinzou controlling the supply of arms, they felt free to take as many of them as they wanted after finding the key to the study on Genji’s body. Indeed, they have found all of the bodies by now, and the grandchildren have woken up and learned what happened. In the meta world, the meta characters go over what was found by the parents. There are five master keys, one for each servant. One master key was retrieved from each dead servant, and next to each dead body was an envelope containing a key to the room where the next body was found. The bodies were found in the following order: Shannon in the parlor, Kumasawa in a room on the second floor, Gouda in a room on the third floor, Genji in another room on the second floor, Kinzou’s burnt body in the boiler room, and Kanon in the chapel. And there was a key to the parlor next to Kanon’s dead body which completes the circle. Six rooms basically form a composite locked room murder mystery. The six people were not killed by traps. No one among the six victims committed suicide. Among the six victims, … an accidental death. But she is cut off before she can complete the sentence, where the missing part is presumably either “no one suffered” or “there is”. (The missing part is in the middle above because of differences between English and Japanese grammar.) She is cut off by Ronove, who stops her from speaking anything else and disappears with her after requesting a timeout. Meta-Beatrice looked like she was being pushed in a corner, and meta-Ronove must have realized it. Back in the real world, the parents are struggling to stay on their guard after not having slept a wink the previous night. This is when Eva’s alter ego appears to belittle Eva about giving up on stealing the right to the family headship from Klaus. Eva defends herself by murmuring how she has no idea what the beginning of the inscription even means. Eva’s alter ego suggests that the river mentioned might not even be an actual river with flowing water, and suggests that Eva try to think of what comes to her mind concerning “river” (川, ‘kawa’). Eva is now descending down a set of stairs which presumably lead deep underground, where at the bottom is a door which has the tenth twilight written on it seemingly in blood. Behind the door she finds a rather well-furnished room, and next to a bed she finds a pile of gold. Now that Eva has found at least some of the gold, what will she do now? What does it mean that the tenth twilight was written on the door to the room with the gold? I somehow doubt that it means that the killings will stop, but at least the parents do not seem to be ultra-paranoid of each other. It’s nice to see them acting intelligently, since they know that none of the parents could be directly responsible for the murders as they were all up talking with each other during the night. However, I suspect Nanjo will soon come under suspicion with him being the only surviving adult without an alibi. Apparently the previous Beatrice, a.k.a. 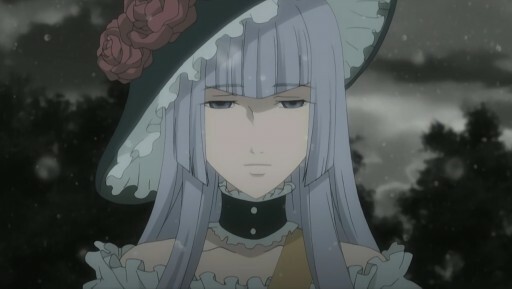 Vergilia, had become the Endless Witch after taking the present Beatrice as a student. Or maybe being the witch Beatrice is intrinsically tied to being the Endless Witch, and the previous Beatrice was lying about trying to become one in episode III-I. I don’t think the transfer of name and title to the student was done willingly. Kumasawa may not have been Vergilia in the previous arcs. Vergilia does not seem to be the sort of person who plays being frightened just for the heck of it. On the other hand, it doesn’t mean she didn’t have some ulterior motive for acting, and Kumasawa did talk like she was in the know in the beginning of the second arc. Speaking of Kumasawa, it reminds me of the evil spirit that was supposedly sealed on the island. It might be unrelated to Beatrice, but she is taking advantage of. It might also end up being a third side against both Battler and Beatrice in some far distant story arc. Why did Ronove stop Beatrice from talking? I’m guessing that it is either because she was about to lie in her red text, which could void any risk for her and render her magic powerless, or she was increasingly saying things that would eventually make the truth obvious: e.g., one of the bodies may have died of sickness. The murders could be explained without magic if Kinzou was the perpetuator. He could have prepared a dead body with six toes on a foot beforehand, and it wouldn’t conflict with the confirmed truth of there being less than nineteen people being on the island. (If you’re not going to count witches, it would be silly to include dead bodies.) This might also explain the murders in the first arc. Remember how there is more than one gun? Kinzou may have been the one to shoot Natsuhi in the end. If the inscription is to be believed, then someone should have found the key to the golden land before the initial six victims were killed. But Eva found it after: I suspect someone else had already found it and started this whole mess. 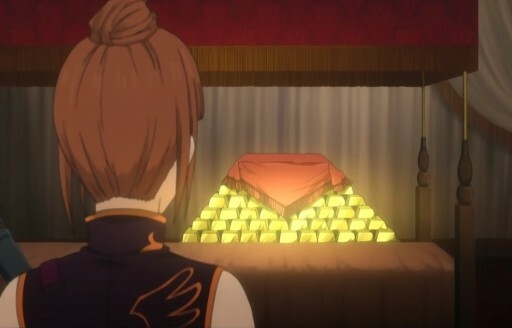 Remember how Klaus showed Natsuhi a gold bar in episode I-II? That’s who I suspect. I could never stop myself thinking of another character from Higurashi no Naku Koro ni whenever Eva spoke. Now I even more strongly suspect that Lambdadelta must be behind Eva’s alter ego. On the other hand, Eva’s alter ego does look a bit like the girl in the portrait in the opening credits. On yet another hand, the girl in the portrait looks like someone who appears elsewhere in the opening credits, who doesn’t seem to be Eva (blue versus purplish eyes). Nice theories. It’s always a pleasure to read them. 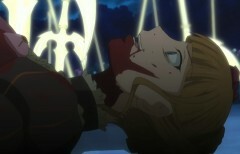 It should be made clearer- Virgilia did willingly pass her title to Beato. But now she decided that Beato isn’t fitting to be her successor nor a witch, as she uses ‘endless’ for evil purposes and these games. You theory about Ronove shutting up Beatrice is correct – she was giving away too much information that would help him and hurt her in the long run, so he shushed her. Also I’m curious – what makes you sure this ‘alter Eva’ is Lambdadelta’s doing? 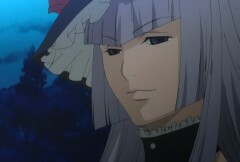 Maybe Eva’s just imagining her, or maybe Beatrice showing us her existence to trick us. I’ve seen the ‘Virgilia’ spelling in a lot of places (it’s a pain looking up names while avoiding any other spoilers, but just looking at Google’s summary helps), but I wonder where the spelling comes from? It’s not on the websites for the anime nor 07th Expansion. Then again, maybe the spelling appears within the game, which I have never played and never will at least until the anime ends. ‘Virgilia’ is the spelling used by the VN translation group Witch Hunt and is considered the most refined spelling of the romanizations, since romanizing some of the names is difficult (I think they even emailed 07th expansion once to make sure some of their name translations were accurate). It also references to Virgil (‘Virgil’ia) too. About ‘alter Eva’ possibly being Lamdadelta’s doing, see Ian’s answer. The alter Eva also recited the riddle decades ago, although it may have just been something already widely known among the Ushiromiyas that only got engraved a couple of years ago. That’s for the magical ‘truth’. In the non-magical ‘truth’, I would say she is just talking to herself. But that was in a dream. You can say that Eva dreamed she was talking to an alter ego perhaps and since Eva already knew the epitaph it was just her subconscious perhaps cheering her on. True about Eva’s dream possibly being a retroactive rewrite instead of an actual memory. In any case, I’m not sure about Lambdadelta’s involvement with her alter ego: it’s just a strong feeling. As long as it doesn’t contradict with the red truths, anything goes. 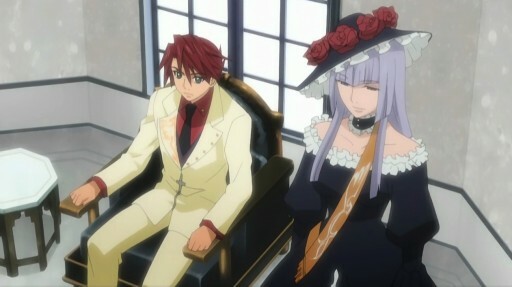 So Battler’s job is to come up with as much theories as possible and Beatrice has to counter it with reds. And Eva didn’t just found some gold, she found “ten tons” of gold, which worth billion yen (around 300 million dollars). Don’t let the size fool you, since gold has very high density, it’s volume can be misleading. I think the Higurashi character you’re thinking of is Takano, because Takano and Eva share the same voice actress. However, only the actress who played the adult Takano playes both the adult and young Eva’s. 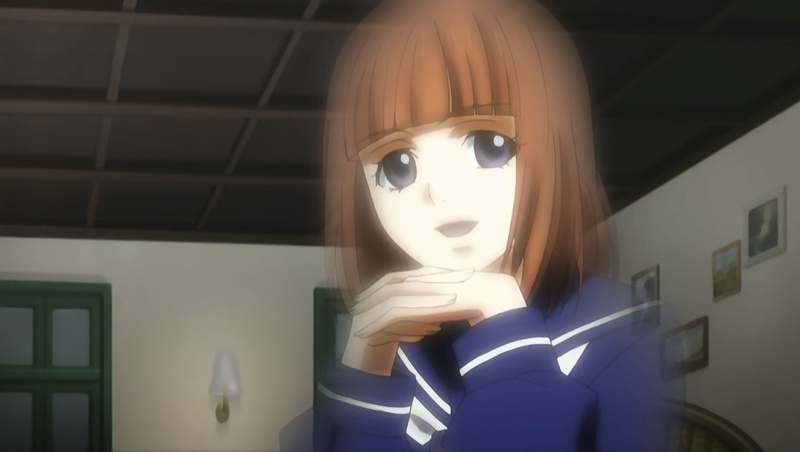 The young Takano shares a voice actress with Lambdadelta, since they too seem to have a connection to the extent that they virtually look exactly alike. Wait, was that spoiling Higurashi? Agreed about Kinzo. I’ve been suspcious about him from the first arc. In any case where there’s been a murder with an unidentifiable face, I think that’s grounds for suspicion. This is the second arc he’s been burned in the furnace right? And in the other arc, he was torn apart by demon goat butlers – which I’m somewhat skeptical about. I dont know if you’ve seen Higurashi, but Kinzo’s death reminds me of an event in that show which provided a major clue to the mystery. True, but I like to think we’re in for a different surprise this time. I’d be disappointed if it was as you say it is. this may sound pretty stupid, but..
Takano’s burnt body is found in a barrel. If you ask me, Ronove cut Beato’s red text off for a good reason. I’m positive she was gonna say that an accidental death among the six did NOT occur. I mean, if she had said that, it would lead to Battler concluding that the six were indeed killed by other people, which would probably give Battler an even bigger advantage because i’m sure he had something thought up for that possibility too. I’m also pretty sure that was what she was going to say (it wouldn’t make sense to defend against Battler’s speculation about an accidental death by saying there was one), but I’m also pretty sure that Battler concluding that the six were all murdered is not the conclusion Beatrice and Ronove are trying to avoid. The whole line of questioning did start because Beatrice was unable or unwilling to confirm that all six were murdered, after all.